With so many of my blogger friends, and followers hosting Halloween parties this year, I have found myself constantly making mental notes of things that could be used for Halloween parties, as well as "pinning" all things Halloween on pinterest. 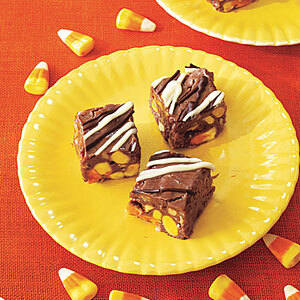 When I came across the Candy Corn Fudge on I'm a NOLA girl's blog, (photo below also from her post) I just had to share. This would be great for a party, or even an office treat. 1. Line an 8-inch square pan with foil; butter foil. Combine marshmallow cream, sugar, evaporated milk and butter in a large, heavy pan. Bring mixture to a boil over medium-high heat. Cook, stirring constantly, until mixture reaches 235°F on a candy thermometer, 10 to 15 minutes.